PT Gapura Angkasa - Gapura Angkasa is a reputable airport services company in Indonesia, headquartered in Jakarta. 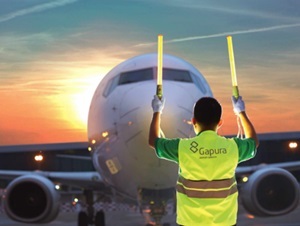 Gapura Angkasa engaged in ground handling and flight support services. Its business include passenger and baggage handling, cargo, warehousing, flight operations, and aircraft services. PT Gapura Angkasa is a joint-venture company between 3 state-owned companies; PT Garuda Indonesia (Persero) Tbk, PT Angkasa Pura I (Persero) and PT Angkasa Pura II (Persero). As of December 2016, PT Gapura Angkasa is 58.75% owned by Garuda Indonesia Group, 31.25% by PT Angkasa Pura II (Persero), and 10% by PT Angkasa Pura I (Persero). Gapura Angkasa now operates in 57 airports in Indonesia; consists of 31 branch offices and 26 representative offices. In term of financial performance, Gapura Angkasa registered total revenue of Rp 1.49 trillion in 2016. This number reflected an 13.23% increase from the previous year of Rp 1.32 trillion, according to PT Garuda Indonesia (Persero) Tbk Annual Report 2016 as cited by JobsCDC.com. Gapura Angkasa registered total profit of Rp48.78 billion in 2016, a decline compared to the previous year of Rp85.34 billion. Total assets per December 2016 amounted to Rp1.76 trillion, there was an increase 75.53% from Rp 1.00 trillion in the previous year. Male/Female, not over 30 years of age. Candidate holds at least a Bachelor Degree of Information System, Information Technology, Management Information System. Both fresh graduate and experienced (preferable) candidates are welcome to apply. Excellent verbal and written communication skills in English (TOEIC certified). Able and accustomed to work in multitasking and under pressure. Willing to be placed in the Head Office Gapura Angkasa or Soekarno Hatta International Airport. JobsCDC.com now available on android device. Download now on Google Play here. Please be aware of recruitment fraud. The entire stage of this selection process is free of charge. PT Gapura Angkasa - Fresh Graduate Project Analyst Garuda Indonesia Group April 2018 will never ask for fees or upfront payments for any purposes during the recruitment process such as transportation and accommodation.